Syracuse’s senior game tonight against DePaul features two members of the Orange making their definite final appearances at the Carrier Dome as players: Brandon Triche and James Southerland. 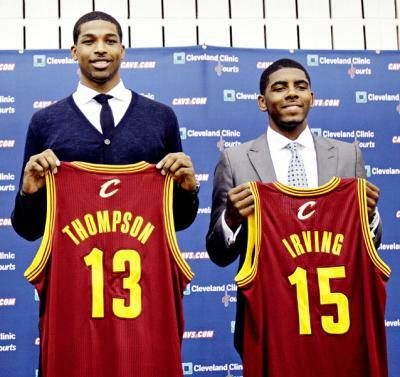 However, few would bet that these are the only two scholarship players who will move on after this season. The best bet is that Michael Carter-Williams will join them despite his recent bouts of poor play. Some Syracuse fans argue that he could use more seasoning in college, and they’re not wrong, but many forget that despite being a true sophomore, MCW is already 21 years old now and will be 22 before next season. MCW would be the eighth Syracuse player in six seasons to leave school early, with four of those players — Donte Greene, Jonny Flynn, Wes Johnson, and Dion Waiters — picked in the first round of the NBA Draft. Waiters, who played with Carter-Williams last season, weighed in: “Michael’s a 6’6″ point guard. You can’t teach height. If he comes here, he’ll get nothing but better.” In his Syracuse.com piece on the subject, Bud Poliquin also mentions C.J. Fair and Rakeem Christmas as possible early departures, but those seem like stretches from this observer. In the classy moves by coaches department, Rick Pitino announced that junior Gorgui Dieng will be allowed to participate in Senior Day festivities in anticipation that the center will make the jump to the NBA after this season. “He has given us more than we have asked for. It is in his best interest to come out, and I think he is ready… He has been great for us. I have enjoyed coaching him so much. It is going to be a very difficult Senior Night. I have had some difficult ones, but this may be the most difficult.” There is definitely an argument to be made for keeping senior days for those who finish out their four years of eligibility, but I have no issue with exceptions being made for people like Dieng who were both great players and, by all accounts, students in addition to players during their time in college. This is the point of the season where teams look to ramp it up and start playing their best ball as they head into postseason play. Pitt’s Talib Zanna had been in an extended slump, averaging just 5.5 points per game for an extended period after averaging 13+ PPG for the first two months of the year. Recently, however, it seems like Zanna has started to find his rhythm again, and that doesn’t bode well for teams at the Garden next week. In Pitt’s last home game against Villanova, Zanna went off for 14 points and 19 rebounds in an overtime victory. Pitt closes the season at DePaul on Saturday before preparing for their final Big East Tournament. Cincinnati basketball hasn’t been the most beautiful version of the game this season, and things have only been worse in that regard with the constant injury issues that have befallen Cashmere Wright. He popped his shoulder out of the joint for the sixth time in Monday’s loss to Louisville, according to Mick Cronin. In the last few games, it seemed like Wright had been getting closer to 100 percent, which he clearly hasn’t been since a mid-January injury against DePaul. If Wright can’t find his shot and the lion’s share of the Bearcats’ scoring falls on Sean Kilpatrick’s shoulders in the postseason, Cincinnati will continue to struggle to score in the season’s most important games. Scott Martin’s career has been plagued by injuries, so if the Notre Dame forward can’t maintain a long career overseas, he has a fallback plan in coaching. Mike Brey believes that Martin is well-suited for the sideline: “I think he’s going to be a hell of a coach.” In a Chicago Tribune article, Martin discusses how he’s begun to watch the game through an analytical lens and former Irish teammate Ben Hansbrough admitted that he and Martin discussed coaching after their careers had wrapped. Martin’s constant injuries may have derailed a promising career, but it is good to hear that he has a strong plan for after basketball…well, after playing basketball, anyway. Sports Illustrated: In minor news that is of little interest to anyone, Notre Dame will be joining the ACC as a full member in all sports but football, where it will remain an independent but still schedule five ACC teams each year. This is strong news for the conference on the basketball side of things as Notre Dame has been ready to contend in most recent years. Though it’s likely to be a year or two before the Fighting Irish fully join the conference, once they are here, they will be here to stay. The ACC also approved a new exit fee for schools looking to leave the conference and the price tag is a little north of $50 million. In other words, get comfortable, Florida State. Raleigh News & Observer: Somehow, the story is still about Notre Dame, even when it’s about North Carolina. In the wake of the internal audit that revealed inappropriately paid for personal trips by UNC’s chief fundraiser Matt Kupec, Tami Hansbrough has joined Kupec in resigning her position. The story is pretty simple: The two were romantically involved and used the university’s money to pay for trips to watch former Tar Heel and Tami’s son Tyler Hansbrough play a couple of NBA games, but mostly to pay for trips to watch Tami’s other son, Ben Hansbrough, play for Notre Dame. It’s unclear whether this news is better or worse now that the Fighting Irish are headed to the ACC, though it remains, undeniably, really stupid. Daily Press: When the ACC was taking submissions for conference tournament sites for the years 2016-21, they get at least one unusual candidate: Consol Energy Arena, located in Pittsburgh, a bit farther north than the tournament is customarily held. The ACC Tournament has never been held farther north than Landover, Maryland, but the home of the Pittsburgh Penguins is going to take a shot at getting it. With the conference’s center of gravity now gradually shifting north after the recent realignment additions, the possibility makes a good deal of sense, particularly to those not as enamored of the charms of Greensboro, North Carolina. They do whatever they want. It doesn’t even do any good to fight it. The NCAA just wants kids to fail. It’s not these kids’ fault. The NCAA can’t penalize Notre Dame Prep, so they are squashing the kids’ dreams. 5. ESPN: Mark Gottfried’s recruiting continues to impress as the NC State Wolfpack secured the services of one of the best point guards in the entire 2013 class. Anthony “Cat” Barber signed on to wear red in Raleigh, and the Wolfpack just got a little scarier. Hopefully that will help ease the agony of the still-unresolved situation with Rodney Purvis. Think back to November 24, when many teams were playing in early-season tournaments and fans were able to get a strong first glimpse of their favorite teams. Notre Dame got plenty of exposure that week, but for all the wrong reasons. The Fighting Irish had just incurred a 29-point beating at the hands of Missouri in the CBE Classic semifinals and followed that performance up with a loss to Georgia in the third place game. The next day, star senior forward Tim Abromaitis suffered a torn ACL in practice that would immediately end his season and seemingly the team’s too. If you told a Notre Dame fan back then that three months later their team would be 10-3 in conference on a seven-game winning streak in the Big East, it would be truly hard to believe. For that, and many other reasons, Irish head coach Mike Brey is the current leader in the clubhouse for National Coach of the Year once again as we head into the home stretch of the regular season. Brey has been named Big East Coach of the Year three times (’07, ’08, ’11), and was the AP National Coach of the Year last season for guiding his team to an unexpected run at 27-7, an NCAA Tournament 2-seed and #5 overall ranking when the season ended. Coach Brey also has a habit of making a splash with his team in conference play when it looks like it has no chance to be competitive. Think back to two seasons ago, when the Fighting Irish were sitting at 6-8 in the Big East on a crash course for the NIT before Brey led the team to four straight victories to end the regular season. Then came a deep run in the Big East Tournament, and Luke Harangody, Ben Hansbrough, Abromaitis, and company were safely in the NCAA field, from NIT to 6-seed in just three weeks. 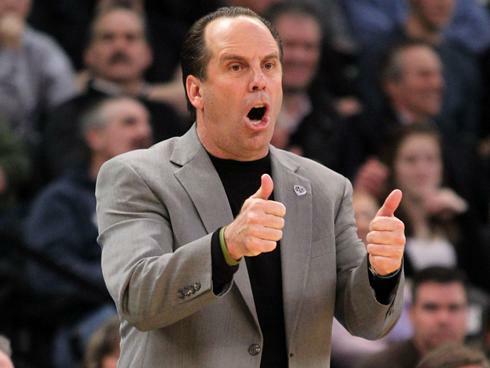 The head coach in South Bend doesn’t get the same kind of recognition as some of his conference coaching peers like Jim Boeheim, Jim Calhoun, and Rick Pitino, but Brey has often done as fine a job as them with far less talent to work with. Evidently former Texas star Jordan Hamilton feels he should have gone higher than 26th in Thursday’s NBA Draft, and he thinks his former coach may have had something to do with that. After the draft, a writer asked Hamilton how he felt about going lower than he’d been projected. Hamilton tweeted the writer back, saying that “(Coach Rick Barnes) called some teams and said that I probably wasn’t coachable and things like that.” Whether it’s true or not, it’s likely not the first time that such critiques have reached Hamilton’s ears; that opinion was put forth often enough last season by journalists, bloggers, and certainly UT fans. What’s important now is that Hamilton take advantage of this new beginning and make it so nobody can grade him in that fashion ever again. Hamilton’s complaint will fall on deaf ears, if those ears belong to former Notre Dame star Ben Hansbrough. The reigning Big East Player of the Year went undrafted on Thursday and has signed to play professionally in Germany for a year. Interesting move, and quite shrewd. You’d think an undrafted player who still harbored realistic NBA dreams would want to stay as near to the league as possible, and would hang around the D-league or at least play summer ball here. With an NBA lockout looming and the summer league cancelled, a quick jaunt to Europe for a year to get paid while keeping the skills sharp — and hey, we hear the beer’s good — seems a smart play. First it was the Celtics and Lakers, and maybe more recently…the Timberwolves? It looks like the Minnesota franchise may — or may not — have contacted Mike Krzyzewski about filling their recently-vacated head coaching spot. He’s not going. You know you’re a legend when people report that it’s possible someone contacted you about another job and you’re not taking it and nothing’s changing. Watch this space, because a little later we’ll have an update on the condition of former Spanish dictator Generalissimo Francisco Franco. Meteorologically speaking, it was a strange spring in the midwest; there was an extended winter followed by a much bigger-than-usual onslaught of tornadoes followed by a heat wave followed by more unrelenting rain. Gene Keady Court inside Purdue’s Mackey Arena has felt the effects, and in fact has been rendered unfit for use. All is not lost, however, as MSNBC’s Mike Miller points out. Yesterday would have been the 10th birthday of Emma Key, the daughter of Houston Baptist assistant coach Steven Key. Today is the birthday of Steven’s wife/Emma’s mom, Sherry. A couple of months ago, SI.com’s Andy Glockner wrote a story about Emma’s death and the effect — God, what an insufficient word — it had on not just the Key family but the HBU program, as well. We saw the author’s tweet from Sunday about Emma’s birthday, and that he included the link to Coach Key’s Twitter account, so we hope it’s OK that we choose to re-link Mr. Glockner’s story here today. If you didn’t read it back in May, please do so, right now. 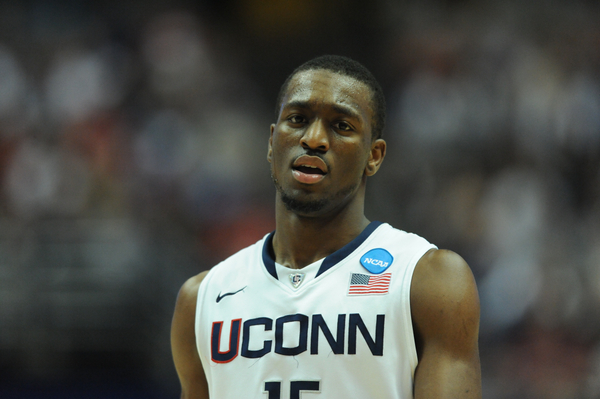 G- Kemba Walker, Connecticut, JR (23.5 PPG, 5.4 RPG, 4.5 APG, 43% FG, 82% FT, 33% 3pt)– Walker was the captain of the most improbable championship run since Danny Manning’s Jayhawks in 1988. The diminutive scoring guard captivated the country from his heroics in Maui to an incredible 11 wins in 28 days to finish a memorable season. 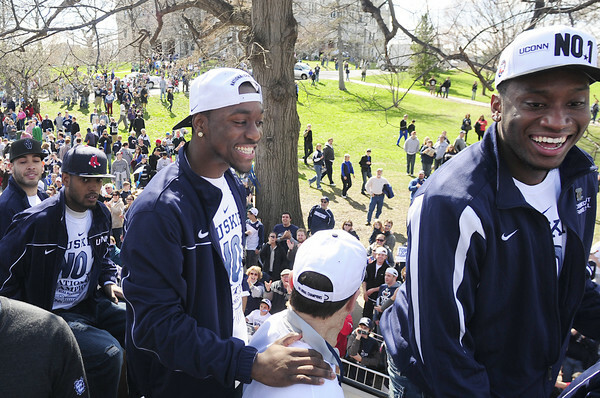 Walker finished fourth in the nation in scoring, was named Big East Tournament MVP and carried a Huskies team packed with underclassmen to unimaginable heights. G- Jimmer Fredette, BYU, SR (28.9 PPG, 3.4 RPG, 4.3 APG, 45% FG, 89% FT, 40% 3pt)– Jimmer moved into All-American lock status the moment his first name became a verb. Fredette led the country in scoring and captured the attention of even the most casual hoops fans with his in-the-gym shooting range. Fredette will forever be remembered as one of the best shooters in collegiate basketball history. G- Nolan Smith, Duke, SR (20.6 PPG, 5.1 APG, 4.5 RPG, 46% FG, 81% FT, 35% 3pt)– Smith nearly became the first player in ACC history to lead the conference in scoring and assists during a commendable senior campaign. A multi-dimensional scorer and distributor, Duke’s most valuable player manned both guard spots this season and excelled with flying colors. 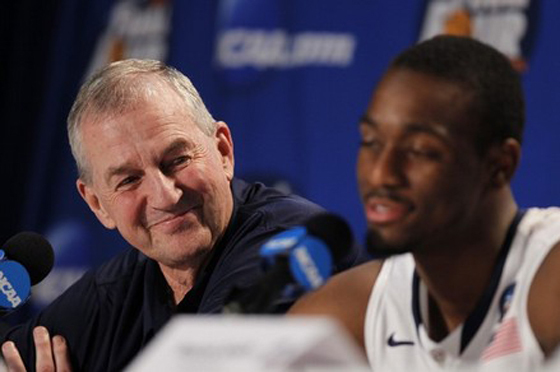 He was the glue that held the Blue Devils together from November to March. F- Derrick Williams, Arizona, SO (19.5 PPG, 8.3 RPG, 60% FG, 75% FT, 57% 3pt)– The most efficient player in the nation, Williams displayed awe-inspiring athleticism and versatility. A dynamo in isolation situations, Williams led the nation in free throw attempts and shot an incredible 57% from deep as a power forward. The sophomore is likely to be chosen #1 overall in June’s draft for good reason. F- Jared Sullinger, Ohio State, FR (17.2 PPG, 10.2 RPG, 54% FG, 70% FT)– Unanimously voted as this season’s freshman of the year, Sullinger lived up to his billing as a low-post force to be reckoned with. Sully averaged a double-double as a freshman in the rugged Big Ten and his capabilities in the paint opened up countless shot opportunities for a willing and able supporting cast. Sullinger is the early favorite for NPOY in ’11-’12 if a sophomore season happens as promised. Throughout conference tournament weekend, we’re going to pop in with some BGTD-style analysis at least twice a day. For a recap of the action earlier today, check out our afternoon BGTD post. Jimmer goes off. 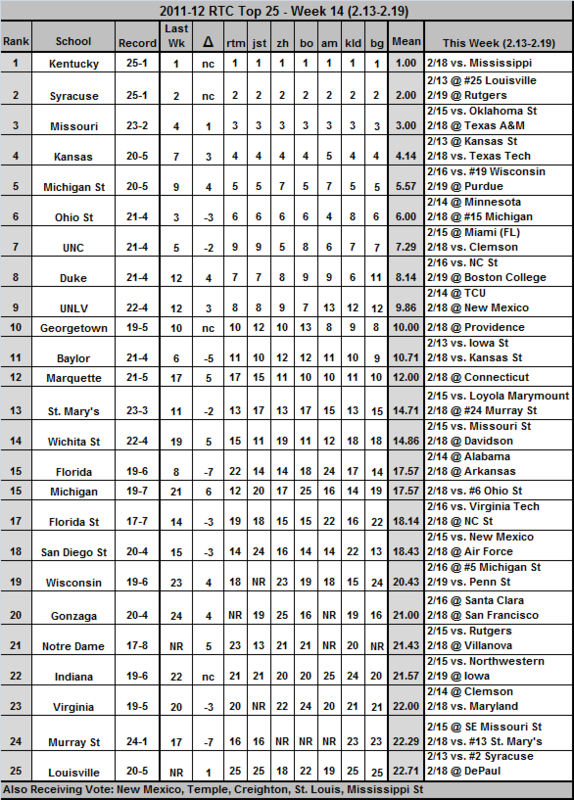 For most of the past week we have focused on who BYU doesn’t have (Brandon Davies) while seemingly ignoring the who they do have (Jimmer Fredette) and Jimmer reminded us how good he can be thanks to a ridiculous 52-point performance to knock off New Mexico, a team that had beaten the Cougars the two previous times they played this season. We aren’t saying that the Cougars are still a contender without Davies because we think they lack the depth to make it past the second weekend without him, but with Fredette and a decent supporting cast we wouldn’t be the least bit surprised to see the Cougars in the Sweet 16. As for Fredette, this should basically be the stamp on his national player of the year campaign. There are plenty of excellent players this year (more on a few in a bit), but nobody has been as dominant throughout the entire seen as Fredette. OT at MSG. The Big East seminfinals provided us with a pair of excellent games that required an extra session. In the first semifinal Kemba Walker finally played like the phenomenal player we saw in Maui, but UConn still required an extra 5 minutes to knock off Syracuse after a pair of huge threes by Scoop Jardine late in regulation. In the end, Walker (33 points, 12 rebounds, 5 assists, and 6 steals) and Alex Oriakhi (15 points and 11 rebounds) were too much for the Orange. In the nightcap, Louisville overcame a 14-point halftime deficit against Notre Dame to force overtime and join the Huskies in the Big East finals. The key for the Cardinals was forcing Ben Hansborough into numerous poor shots as he ended the day 3 for 16 from the field. The Cardinals comeback victory sets up an intriguing Big East final match-up involving two of the league’s most controversial coaches who each have dealt with major issues in the past year (Rick Pitino‘s being personal and Jim Calhoun‘s being professional). One thing to watch for is the Huskies legs as they are attempting to become the first team in Big East Tournament history to win 5 games in 5 days. You might also want to watch for how the Huskies respond when they get to the NCAA Tournament as all these miles might begin to take a toll on them. Toe Problems at Duke. Normally we would brush off Nolan Smith‘s toe injury against Maryland in a game that the Blue Devils won handily, but given how innoucous another toe injury to another Duke guard (Kyrie Irving) seemed at the time we think the Blue Devils will be a little more cautious heading into their game against Virginia Tech.